A very unusual seismic phenomenon is currently taking place in Nebraska. There were 4 earthquakes in central Nebraska on April 9th and 10th. The first one, with a magnitude of 3.3 shook near Arnold, Nebraska Monday morning, at 4:33. The next quake held off until Tuesday morning, starting at 6:41, hitting with a magnitude of 3.7. 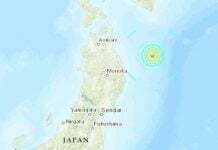 Just over 10 minutes later, a weaker 2.5 magnitude earthquake struck nearby. 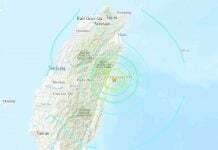 Later in the morning, a 3.3 magnitude earthquake hit in the same general area at 10:49. 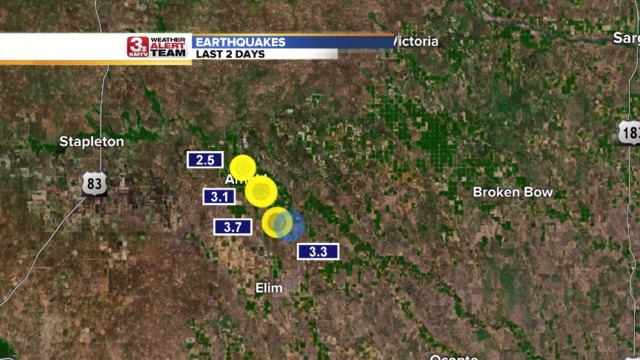 Very unusual: 4 earthquakes hit Nebraska within two days. All 4 earthquakes were about 5 km under the ground. Each one was considered weak. While people reported feeling the shaking, no damage was reported. It’s not normal for Nebraska to see so many earthquakes in a week, or even a year. The state averages just one earthquake each year. 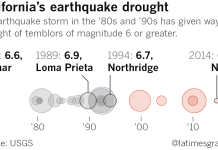 Since 1931, the state has been shaken by quakes just 45 times. Last year, in 2017, there were none. The strongest earthquake on record in the state had a magnitude of 4.3, which happened in Grant County, on May 7th, 1978. More recently, an earthquake more comparable to this week’s, was a 3.6 in Auburn, Nebraska on December 12th, 2009. Is that a new normal for Nebraska? In 2015, the USGS added a new region – Oklahoma and its fracking-induced quakes – on its earthquake hazard map. Do you think those Nebraska’s tremors were also human-induced? Is Nebraska becoming the next Oklahoma? Oddly enough though they are showing none on the USGS now for whatever reason, there were in fact a few last year in NE regardless. Being in KS I watch them pretty closely. They were in about the same area on the N end of the Humboldt fault activity coming from OK up through KS. FWIW. They are not rare there but they are uncommon. I have a feed from a private seismo up there, will see if I can get his info pulled. That would be interesting! Thank you! I wonder if it has anything to do with the Fracking going on there. PUBLIC SECURITY SECTION 9 AGENT PAZU SAYS: Vodka and Rum with 2 lemons, shaken not stirred!